While progress has been slow in the field of veterinary orthotics and prosthetics, it has not stalled. Veterinary specialists say advancements in materials, increased awareness, published studies, more educational opportunities and customization represent promising developments in this field. Dr. Mich is senior veterinarian at Wheat Ridge Veterinary Specialists in Colorado and a specialist in sports medicine, pain management, rehabilitation, and orthotic and prosthetic devices. Brian S. Beale, DVM, Dipl. 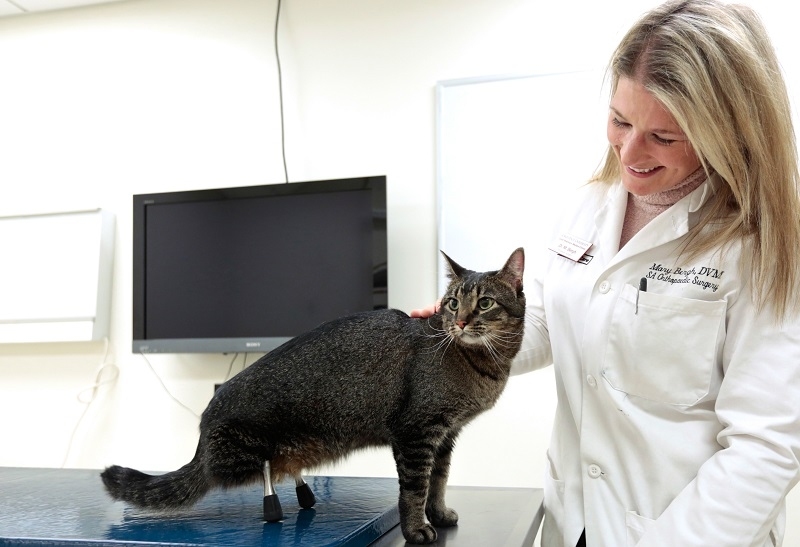 ACVS, of Gulf Coast Veterinary Specialists in Houston, said some of the most recent material advancements in veterinary orthotics and prosthetics include carbon fiber and silicone padding. He described carbon fiber as lightweight, strong and waterproof, and he said the energy return restores life to a pet’s leg. Borrowing from technology used with people suffering from diabetes or ulcers, manufacturers are utilizing silicone padding, which functions better than traditional foam, said Dr. Beale, an adjunct assistant professor at the Texas A&M College of Veterinary Medicine. Also trickling down from human medicine is custom orthotics. A benefit Dr. Henry has experienced with customization is using the prosthesis in older patients who would have required joint arthrodesis. The availability of more orthotics and prosthetics locally, instead of through mail order, has made custom fits and modifications easier, Beale said. Another development is that instead of traditional casts, more specialists are enlisting orthotic braces, which are easier to care for and cause fewer problems with wounds, Beale said. He added that range-of-motion hinges may be incorporated in orthotics and prosthetics as well to prevent stiff joints and muscle atrophy. Much of the progress seen in this field stems from growing client interest, accompanied by a drive for creativity from orthotists, prosthetists, physical therapists, rehabilitation therapists and veterinarians. “Awareness is rapidly increasing, [and we are] able to save limbs that previously were amputated,” Beale said. Client interest and demand has helped fuel the evolution of the field and profession, and veterinarians now can find more published studies as well as opportunities to learn about veterinary orthotics and prosthetics at meetings. Some pet insurance providers reported seeing rising use of prosthetics and orthotics, although because of how the companies track claims, the devices are not always listed. Liz Watson, chief marketing officer at Hartville Pet Insurance Group in Akron, Ohio, reported that less than 1 percent of claims relate to orthotics or prosthetics. Trupanion reported paying about $67,000 in claims for prosthetics and orthotics since 2010, with 50 percent occurring in 2015 and 2016. Veterinary specialists point to increased applications such as thorax, spinal, knee, hip and wounds as a key highlight for the future of orthotics and prosthetics. Experts agreed that more research, as well as obtaining and publishing outcome data on the use of orthotics, is necessary for continued progress. Just as continuing education is important for veterinary professionals, Mich said, specialists need more training on “how to do this work from assessment and diagnosis to prescription, fitting adjustment and follow-up. Beale would like to see “development of commercially available intraosseous prosthetics for dogs and cats because they do not have to be removed intermittently to give skin a rest, and they are linked better, more convenient and more stable.” However, “infection, wounds and bone fractures remain a potential problem with them,” he added. Mich called for more competition in fabrication, but with proper fabrication backed with solid knowledge. As three-dimensional printing continues to advance and be tested, it conceivably will be used mainstream in pet orthotics and prosthetics. Whether an animal suffers from a crippling birth defect or traumatic injury, prosthetics and orthotics can provide them with improved quality of life. As education and creative technological advances evolve, even more veterinarians and specialists can help these animals live fuller lives.